Every game on Gamestar Mechanic contains exactly one avatar, a little sprite that forms the connection between your commands and the gaming world. 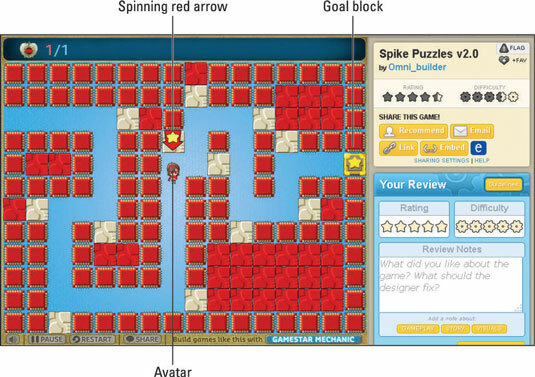 You use the game controls to make the avatar move around and perform various actions. If you aren’t sure which sprite is the avatar, don’t worry: At the beginning of the level, or after you pause and unpause the game, a spinning red arrow points out the avatar for a few seconds. Top-down: You’re looking at the board from above — the bird’s-eye view. The principle of gravity doesn’t apply, so everything appears flat, and all movable sprites can move up, down, left, or right. Platformer: You’re looking at the board from the side. Sprites stand on platforms on which they move left or right or jump into the air. 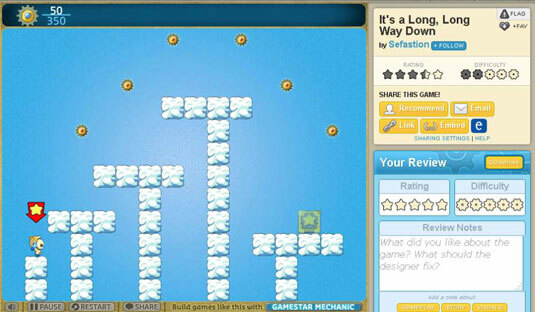 You will see how to use the controls for both types of games. The top-down controls allow for several different configurations, and you can play using any configuration you choose. To use the standard top-down controls, place the three middle fingers of your left hand (the ring finger, middle finger, and index finger) on the letters A, W, and D — and then place your thumb on the spacebar. This arrangement lets you control the avatar with one hand and manipulate the mouse cursor and other keys with the other hand. The arrow keys on many keyboards can be small and cumbersome to use, so this arrangement doesn’t require you to use them. Though you sometimes need to move your fingers to different keys, remember the A-W-D-spacebar position for your hand so that your fingers always return there afterward. There is an alternative system in which you move by using your right hand and operate the other controls with your left hand. Place the three middle fingers of your right hand on the left-, up-, and right-arrow keys, and then position your left hand so that your index (“pointer”) finger is on M and your ring finger is on B. Then you can use the Pause and Inventory buttons more easily — and feel more connected by using both hands at one time. 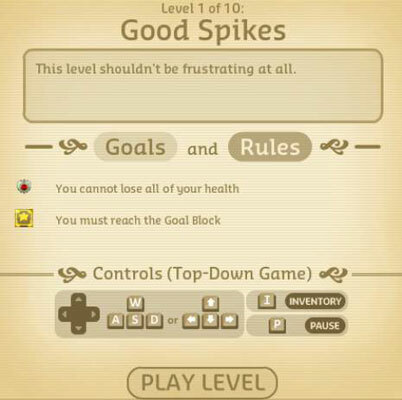 Though the platformer controls are similar to the top-down controls, they work on a different perspective. Instead of moving up or down, the platformer controls allow you to jump. 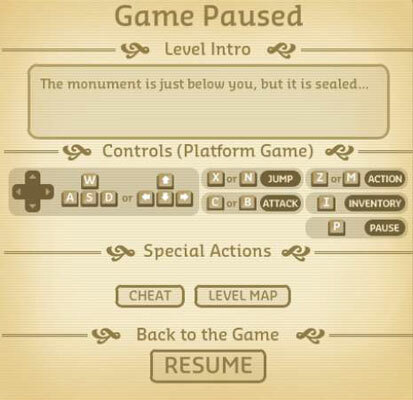 The standard platformer controls use the same keys as the standard controls for a top-down game. Here are the Platformer controls. The Move Up and Move Down keys don’t do anything in platformer games. The W key is used for Jump and the spacebar for Attack. Similarly, the alternative platformer controls use the same positions as the alternative top-down controls, using both hands instead of one. Playing quest missions is a helpful way to become familiar with the controls without having to learn by playing games that are too difficult.